Do you want to try some new? Are you feeling bore by love story or moral story? Here we are representing latest and most scary horror stories and collection of lots of horror story that you ever read. 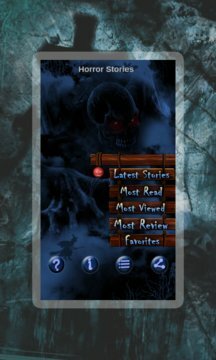 Horror Stories is an interesting application that is collection of many scary, horror or haunted stories. 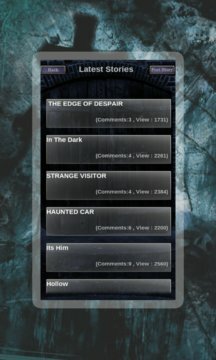 All horror stories in this application filled with thriller, haunted and scary tales. Even it makes you scream in lonely time. We have outstanding collection of scary stories that is able to scare you and entertain you. Hold your pillow and ready to reading these scary stories. Horror stories across all over the world. Post your own horror story if you think it’s able to scare others. Share horror story to your friends. Offline Reading with add favorite feature. Horror theme and user friendly interface. Post your views on horror stories. View others reviews on horror stories. Download!!!!!!!!!!!!!!!! Horror story and share to your friends about the horror stories experience.